Hurrah! The deadly Daleks are back! Yes, those loveable tinpot tyrants have another plan to invade our world. Maybe this time because they want to drill to the Earth’s core. Or maybe because they just feel like it. Coming soon to a cinema near you – Daleks: The Ultimate Adventure! In a world gone mad, only one man stands between the evil pepperpots and their target, the planet Earth! If you think you have seen the Doctor fight the Daleks before, you are wrong; this is the Ultimate Adventure! Also starring Plenty O’Toole as Evelyn “Hot Lips” Smythe! Attendance is mandatory. All praise the glorious English Empire. Remember when the Daleks were scary? Sure, when the genocidal maniacs arrive on the scene, threatening to exterminate anything that isn’t of use to the Daleks…which is pretty much everything…it’s a cause for panic. 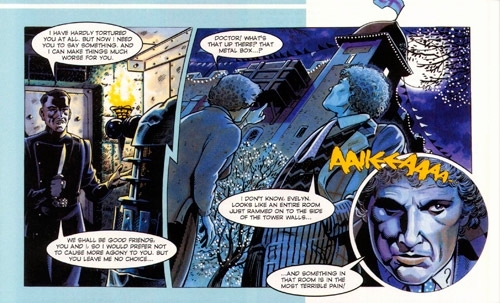 The Daleks have given viewers of Doctor Who some great moments in their time on the show, such as the magnificent “do I have the right” speech from Four in Genesis of the Daleks, Ace taking a baseball bat to a Dalek in Remembrance of the Daleks, and the Cybermen/Dalek trash-talking scene from Doomsday. But sometimes, you get those letdown moments. I compare it to how often the Borg showed up on Star Trek Voyager. Just as often as they showed up, they were defeated by Janeway and her crew. Along the way, the Borg went from “intergalactic threat” to “cosmic joke” as, time and time again, their plans were thwarted and their proclaimed superiority little more than harmful boasting. The last time the television version of the Daleks freaked me out was the Ninth Doctor story simply titled Dalek. Much as the Doctor is the last Gallifreyan survivor of the Time War, the lone Dalek he encounters is the sole remnant of its entire race. But all it takes is that one Dalek, even chained up and helpless, to drive the stoic Doctor into a state of absolute panic and terror. When the Dalek finally escapes, he tears through the security forces with ruthless aggression, exterminating everything in its path. And while Remembrance did it first, Dalek did it best, taking away the biggest weakness of the Daleks with one simple word. But what affected me the most was the fact that the Dalek was screaming one simple question the entire time – “WHAT ARE MY OR-DERS?” Unable to think for itself and reverting to its only primal instinct, without anyone to command it, the Dalek has no purpose. It takes an ordinary human being ordering it to self-destruct for the Dalek’s rampage to come to an end. Dalek is considered one of the best episode of Nine’s run as it not only introduces the Daleks to new viewers, but also shows that the Doctor does, can, and will freak the hell out at the sight of his worst enemy. Robert Shearman was the writer for Dalek. And Big Finish listeners will be very familiar with his audio work, which include the classic serials The Holy Terror, The Chimes of Midnight, Scherzo, and My Own Private Wolfgang. And he also wrote the audio play which Dalek took much of its plotting and thematic work from, the Sixth Doctor serial Jubilee. 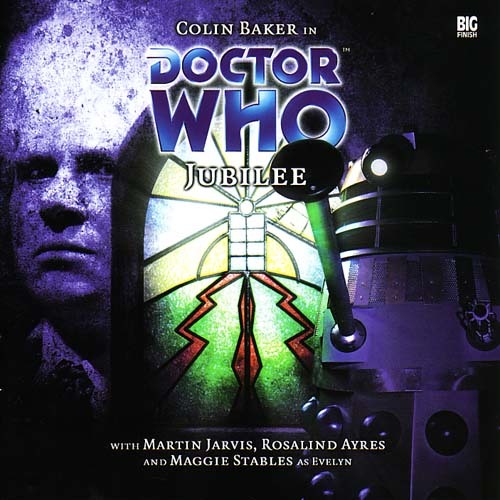 With an absolutely killer script that is both richer and darker than the TV episode it became and standout performances by all involved, including Colin Baker and especially Maggie Stables, Jubilee is a play that’s considered one of Big Finish’s best productions and more than lives up the hype! The English Empire rules the world, and Nigel Rochester, President, is looking forward to the Empire’s Diamond Jubilee celebration tomorrow morning. Cuddling with his submissive wife Miriam, Nigel orders Commander Farrow, his trusted security guard, to torture the prisoner being held inside a steel box annexed to the side of the Tower. During the celebration, the prisoner WILL speak to the citizens of the English Empire, and Farrow has been given carte blanche to do whatever is takes to get the prisoner to talk. When the Doctor and Evelyn are captured and brought before Nigel, Nigel wonders who this man could be in the loud and garishly coloured coat. The Doctor has always been portrayed by Imperial propaganda as a huge, hulking figure of a man, larger than life, savoir of the human race and the English Empire. It’s an easy way to identify the cranks who show up claiming to be the Doctor, after all; the Doctor’s true identity is a closely guarded state secret. But if the Doctor truly is who he says he is, then the prisoner in the Tower will have no trouble identifying him. For the prisoner is the last surviving soldier from the alien invasion in 1903, an invasion that was thwarted by the Doctor himself. And indeed, when the prisoner lays its eye on the Doctor, its cries of hatred towards him are the only identification that is needed. Any praise for Jubilee should begin with its strong script. Shearman is a master as using dialogue to lay out settings which are familiar to the listener, such as a medieval castle in The Holy Terror or the Victorian manor in The Chimes of Midnight, but throwing in enough casual differences to establish early how alien these settings truly are; people are most affected, after all, when something happens to them in a familiar setting, a place where they feel safe. The scene where the President of the English Empire lords over the American Prime Minister is a great example of this as the familiar “Special Relationship” is turned completely on its ear. The Daleks are presented by Imperial media as this grand, dangerous threat that only the English Empire, with the help of the Doctor, could defeat, and 100 years later…there are Dalek soft drinks, Daleks on t-shirt, and even a series of action movies starring the Doctor and Evelyn “Hot Lips” Smythe as the Empire has merchandized evil itself for its own gain. And contractions, for some reason, are banned. When it all gets mixed together, Shearman paints a picture of a dark dystopia that isn’t too far removed from the real world, which makes it all the more unsettling. Where Baker is top-notch, Jubilee seemed to have been written solely for Maggie Stables. She’s been the subject of strong performances, ala The Marian Conspiracy and Project: Twilight, but she’s also been on the receiving end of some weaker scripts such as The Apocalypse Element. But, as I’ve said before and will say again, “there are no bad Doctors or companions, there are only bad writers.” Robert Shearman is not a bad writer, and Stables’ Evelyn Smythe is in many ways the protagonist and driving force of this story. Evelyn has always stood up to the Doctor, and has no trouble bickering or arguing with him. But underneath their words is a relationship the listener knows is rock-solid, lacking in any sort of “hero-worship” many modern companions have for the Doctor. Evelyn is just too old for that nonsense. The pair spend most of serial’s runtime separated, always worrying about the other’s safety. It’s Evelyn, though, who finds out just how much the Doctor cares for her, via the cliffhanger to Episode 2 and the opening to Episode 3 show. Again, to say anymore is to risk spoilers, but it’s very easy to see why Six/Evelyn is considered such a fantastic pairing with such natural chemistry. Even away from the Doctor, Evelyn is still the heart of this story, and it’s her reactions to the Dalek prisoner that form the crux of Jubilee’s plot. With all due respect to Billie Piper in Dalek, Maggie Stables is a veteran actor and the bond that forms between her and the Dalek is both believable and a bit eye-opening for those who are familiar with the Daleks. Everyone wants something from the Dalek – information, its screams, and from the Doctor, its death. In Evelyn’s case, she serves two purposes to the Dalek; one, she’s afraid of it. The Dalek’s jailors have long since forgotten the power of the Daleks, and the Doctor has beaten the Daleks enough times to be worried, but not afraid. Evelyn Smythe, even when alone with an unarmed Dalek with a cracked outer casing, knows enough from the events of The Apocalypse Element to be flat-out scared of this metal monster, and causing fear is one of the few emotions the Daleks are familiar with. The second purpose, however, really hits home to long-time Whovians. Evelyn is the companion of the Doctor. The Doctor has sent his companions into combat against the Daleks, and they have gone willingly. Therefore, Evelyn is a soldier who takes orders from the Doctor, and the chain of command is something the Daleks are VERY familiar with. The concept gives a reason for the Dalek to be interested in talking to Evelyn even as it remains quiet in the face of torture, allowing their conversations to take place without them feeling forced or coerced; it’s one soldier talking to another soldier. Fear, death, orders, power, suicide, the pair cover all those topics and the listener finds themselves following along with rapt interest, in a true testament to the acting skills of Maggie Stables. The Dalek prisoner is the central villain of Jubilee. It’s obvious that Nicholas Briggs is a huge Dalek fanboy, to the extent that he’s provided their voices for Doctor Who’s current revival as well as writing several of the Dalek Empire plays for Big Finish. After listening to Jubilee, it’s easy to see why the BBC placed their faith in Briggs to portray the Doctor’s iconic foes. Opposite of everyone who has dialogue with him, Briggs simply oozes what being a Dalek means; power, rage, the urge to conquer, and the dismissal of lesser beings. The listener never gets the impression the Dalek is playing a sort of long game. It’s just doing what it was bred to do and acting how it was bred to act. It cares about two things, orders and extermination. The sound department deserves high praise here as well, with the rough, gurgling, crawling sound of the Dalek itself drilling into the memories of the listener. And while I’m on it, the simple things like the hum of the magnetic field, the eeriness of a flattened, abandoned London (thanks to a sudden urge for urban renewal and a sudden urge to forget about it; after all, which is more important for the citizens, housing or entertainment? ), and the panicked screams and ray guns of the original Dalek invasions are sounds to behold. Going back to the script, there is a bit of timey wimey stuff involved that is a bit confusing, but not enough to cause any detriment to the play. Shearman explains how the TARDIS ends up in two places at once in a way that makes sense, but how the final climax to Jubilee begins is a bit off-putting. Which is a bit of a let-down, as the realization of getting there is incredibly powerful. History is written by the victors, and while the misdeeds of the losers are played up, the atrocities of the victors are played down as well. Evelyn’s background as a historian is played up as she realizes, with horror, just how much the England ofJubilee’s 20th century has changed. In the end, it’s not the Dalek who is screaming “EX-TER-MIN-ATE,” but the crowd of Londoners at Traitor’s Gate who are chanting “EX-TER-MIN-ATE” for its execution on this, the 100th anniversary of their salvation. The script does a grand job of the whole “humans are the real bastards” cliché in a way that doesn’t feel ham-fisted or forced. There’s no denying the evil of the Daleks, but humans don’t have their hands clean either. In the end, though, it’s the human who has to make the final choice, and I think that’s the best part of Jubilee’s message. While people may hate to look in the shadows and see their atrocities, as long as they’re willing to peer into the dark, there is always a chance to avoid their repetition. Peter Davison is the Doctor in Nekromanteia. This entry was posted in Big Finish Review and tagged Big Finish, Colin Baker, Daleks, Doctor Who, Evelyn Smythe, Sixth Doctor, TARDIS. Bookmark the permalink.